It’s Wednesday. Midweek. Lucy and I hit a few bumps along the road today. Four months of chaos, disorder, sensory assault and social dissonance. The autistic constitution can only be this much resilient. I wonder often how much an average neurotypical is able to endure the same dimensions, levels and consistent torture – and do so with the panache and persistence that many of us autistics execute on a daily basis? Time to retreat and reboot. If only for a mere four and a half days. Saturday bruncheon with Rick at our favourite Not Just Coffee – nourishing noshment and conversation, providing vim and vigour for the adventure ahead. It was so good to be back in our old neighbourhood of Paddington too. A rainy week. Yes, the earth needs to be watered. We do understand. But we cannot help it if our senses recoil from the effects. Lucy hates the rain. I do not yet understand the specifics, such is the nature of purely sensorial non-verbal / semantic communication. There are always pros and cons, of course. I have a plethora of reasons for my revulsion, though. Physical pain in various parts of my corporeal anatomy (let’s skip the specifics, shall we?). Despondent depression, the colour and smell of mud mixed with vomit, woven into a heavy cloak, wrapped around my spirit. Two to go, is that illustrative enough yet? Here was my week in visual snapshots. The images speak better than words, in some respects, but here are my words anyway. 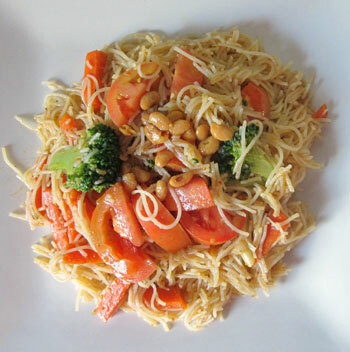 Crispy noodles – leftovers from last night’s dinner. Cream of mushroom and celery with feta cheese bits. Chromatic aberration of a different dimension. Multiple X-rays in the morning. Then the Rheumatology clinic. Throbbing headache – was it the radiation or the combined sensory assault of the strange environment, sonically and visually disturbing whirring machines, flourescent light and gasping for fresh air in the stuffy waiting rooms? Maybe it was the $500 total bill? Today, we were met with three very pleasant encounters. 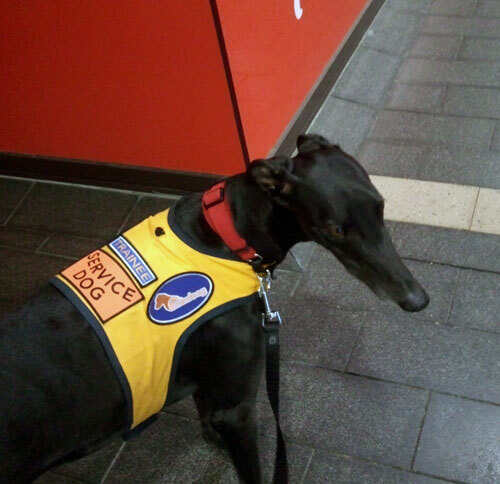 Three different people chatted with us about Greyhounds, assistance dogs and remarked how lovely Lucy is. This mum is most chuffed and slightly puffed up with pride, of course. As soon as we got home, I was seized by a fit of sudden nostalgia, and a crazy desire for something spicy. So, I cooked Mee Siam Goreng today. I used half a Prima Taste Mee Siam Goreng spice pack, with three portions of Chang’s rice vermicelli and the rest of the frozen mixed veggie from Woolworths. Oh, and I also added two fresh tomatoes from yesterday’s box of organic veggies from the Thoughtful Foods co-op, and a small spoonful of preserved salted yellow soy bean. The tomatoes didn’t look as plump and glossy as the ones you find in the big shops, but they tasted more robust and flavourful! Lunch was a vegetarian one, as I was just too lazy to cook up any chicken. Well, it was really good, as is most of the Prima Taste range, but so super spicy that it triggered some really crazy pain in my too acute sensory system. Ouch! The pain was the kind that not only burnt your mouth inside out, but also, for me, the shooting flames went all the way up to my brain and created some interesting pyrotechnics up there. Headache ensued, but this is punishment for the willing – it was delicious! The Foodie Aspie Bunny trundles indefatigably along the rocky road of advocacy and DIY gastronomy!